The Motorola CP200d is a 4-watt (UHF Version) or 5-watt (VHF Version), 16-channel two way radio walkie talkie. The Motorola CP200d provides incredible power and durability and gives you the versatility of operating on both analog and digital channels. This package is the perfect fit for anybody using or planning on using the CP200d. You will receive everything that you need to get your team communicating effectively out of the box. 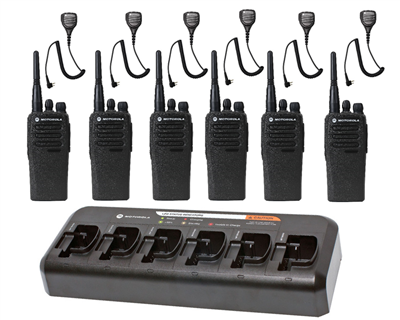 Utilizing the 6-bank charger allows you to keep all of your CP200d two way radios in one place while charging them with only outlet and the speaker mics provide simple push-to-talk communication combined with comfort and ease-of-use. The MOTOTRBO CP200d is perfect for construction, schools, healthcare, manufacturing, and other industrial or large environments.